Welcome back to our Monday morning glimpse into the past, present, and future -- which is known around these parts as What Am I? Today, you get to take a look at this picture and figure out the vehicle it is attached to. Hmmmm, looks British to me. Yeah, those unicorn shifters are really the ones to get. Once we shifted to Narwhal, the quality just went down the toilet. At least we found something to replace the demand for whale after the world moved on from whale oil. The shift pattern looks like a dogleg Porsche 901 box, with the convenient fourth to first downshift shortcut or the even more useful third to second upshift feature. 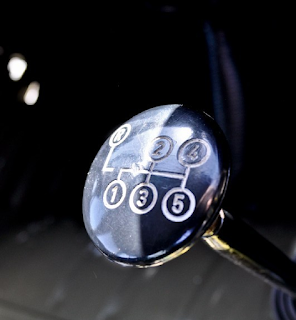 The knob itself looks more like one from a GMC CCKW 6x6 truck with the 10 speed transmission. I actually learned to drive one of those when I was about 10 after mastering the Ferguson but it's been at least 40 years since we sent ours to be scrapped. On second thought military vehicles put the shift pattern on the dashboard so I'm guessing something more agricultural like maybe Ferrari ? I thought it was from a Mercedes bus, but I'm still confused enough to think that its a RHD vehicle. FTB -- in case you didn't know...YOU DONE GOOD AND GOT IT!!! !